The refreshed 2018 Range Rover SVAutobiography is here and it really seems like it’s for people who love the comforts of their own houses so much that they could not bear to leave them behind. So they crammed all the amenities into a Range Rover instead. An extra long wheelbase gives backseat passengers nearly four feet of legroom and seats with 40-degree recline capability, heated calf and foot rests, 22-way adjustment and a hot stone massage function. Here I was, thinking you had to be lying flat on your stomach to get one of those, but what do I know. You’ll also find—to the alcoholic that may or may not live inside you’s delight—a refrigerated compartment that can hold four 20oz bottles or two 750ml bottles and two glasses. That works out to a bottle of wine or champagne apiece. Why’d they bother with the glasses? If you need a break from getting absolutely trashed on a car ride, there are also two 10-inch integrated rear screens and 4G WiFi throughout the cabin. Nothing says luxury like binge-watching House Hunters in your Range Rover and sucking down some chardonnay. The SVAutobiography is powered by a 5.0-liter supercharged V8 with a ZF eight-speed automatic transmission. Zero to 60 mph is accomplished in a claimed 5.2 seconds. 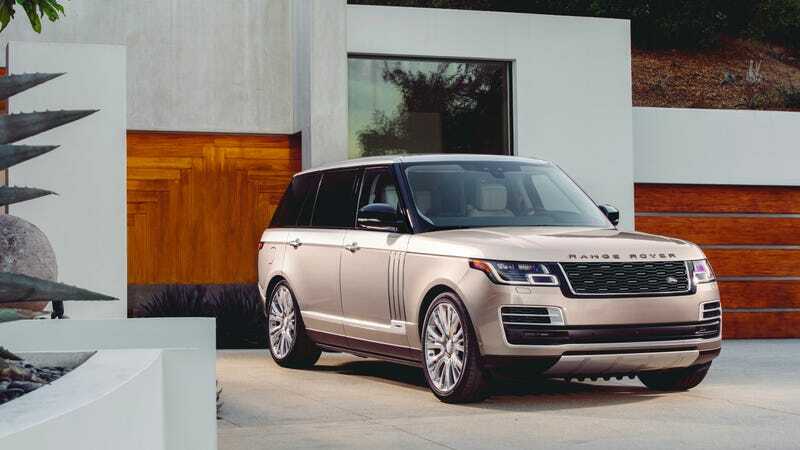 On the outside, you’ll be able to tell this Range Rover apart from the cheap ones by a unique SVAutobiography grille, chrome inserts and unique, 22-inch wheels. Also, the right passenger seat folds down so you can fit—I don’t know, a grandfather clock—more easily inside. Which leads me to conclude that this is the ultra-luxury SUV you want to use when going to your rich but recently deceased relative’s estate sale. All you need to do is cough up $207,900 for it.